In 1816, William Caslon IV produced the first sans-serif printing type, popularised by printers like R. Taylor, who worked in this court. Location. 51° 30.859′ N, 0° 6.531′ W. Marker is in City of London, England. Marker is at the intersection of Red Lion Court and Fleet Street on Red Lion Court. Touch for map. 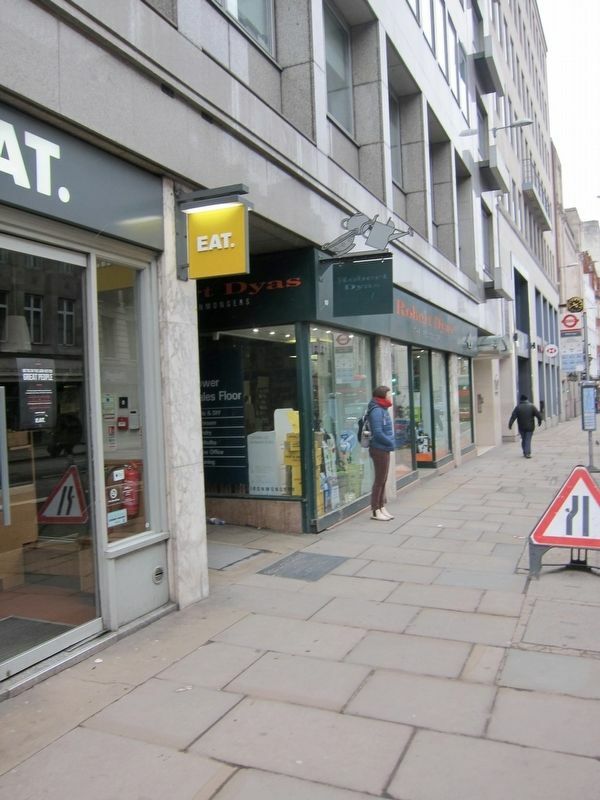 Marker is at or near this postal address: 170 Fleet Street, City of London, England EC4A 2EA, United Kingdom. Touch for directions. Other nearby markers. At least 8 other markers are within walking distance of this marker. British Institute of Professional Photography (a few steps from this marker); Johnson's Court (a few steps from this marker); Dr. Samuel Johnson (a few steps from this marker); Crane Court (within shouting distance of this marker); St. Dunstan's Court (within shouting distance of this marker); Mitre Tavern (within shouting distance of this marker); Bolt Court (within shouting distance of this marker); The Tipperary (about 90 meters away, measured in a direct line). Touch for a list and map of all markers in City of London. 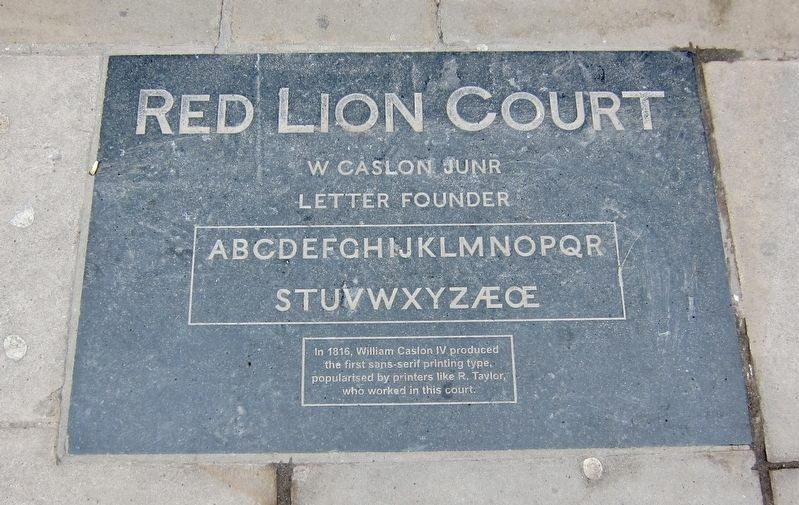 The marker is visible here embedded in the pavement at the entrance to Red Lion Court. More. Search the internet for Red Lion Court. Credits. This page was last revised on May 15, 2018. This page originally submitted on May 15, 2018, by Andrew Ruppenstein of Sacramento, California. This page has been viewed 67 times since then and 6 times this year. Photos: 1, 2. submitted on May 15, 2018, by Andrew Ruppenstein of Sacramento, California.